Mary is someone’s mum, someone’s grandmother, but she’s my mate. She taught me a lot of things by generously sharing her wisdom and experience. Indirectly however, it was that people come from many different walks and directions in life, but mutual and meaningful ground can be found in the circumstances of crossing paths. Here you can plant the seed for what can blossom into a fruitful relationship. That’s what we did. Out of the group of mostly younger volunteers, admittedly, the ‘grandma’ of the group wouldn’t have been my first pick for a compatible friendship – but while I was showing naivety, she was showing an interest. 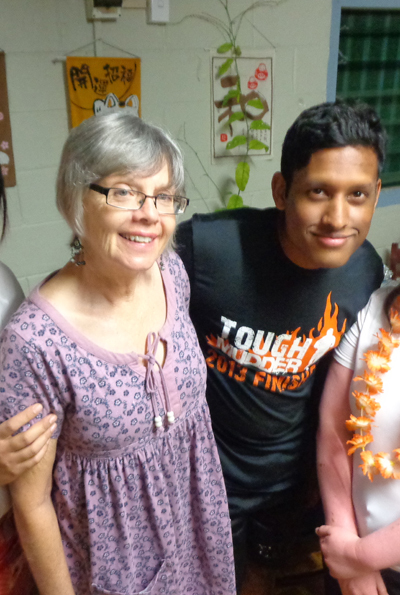 An interest in getting to know me & how my experience as a fellow volunteer was coming along. Luckily, I knew already that you should never close the door on an open ear. From there I had the pleasure of meeting Mary for regular catchups. She was never motherly in any way, and I felt as comfortable in her company as I would with any of my friends back home. We were just two different people going through the same thing. Both willing to share, both willing to listen. We didn’t have the solutions for the difficulties we each faced, but we had support in each other. Sometimes that’s all you need. Occasionally, a reference would be made to something “X amount of years ago” that I couldn’t relate to, because, well, I wasn’t alive then. We’d laugh, and I’d pull my chair in to listen more closely. A prime example, I left home in my early 20’s, but as Mary did, there was a time when it was expected that youths would do the same in their early to mid teens. Having a family and house by the time they were my current age! As she boards her plane to head back to Australia, I’m grateful for the opportunity to have gotten to know Mary – my ‘more grown up’ mate. She is a testament to the fact that you are as only as young as you feel. The rocking chair ain’t rocking yet, so keep rocking Mary.